**** The European Central Bank reduced its forecast for Eurozone growth. **** The Bank of England and UK government officials publicly criticized banks for the irresposible lending and borrowing practices that made them susceptible to the sub-prime crisis. The BofE announced a 'tough love' approach, pledging it would not cut rates and let the market purify itself, while making some concessions and offering bail out capital. **** Russia tested what it called the largest non-nuclear bomb in the world to top off a long, hot summer during which it withdrew from a Cold War arms treaty, renewed long-range bomber flights over the North Atlanitc, and introdcued anti-western history textbooks. **** In other Russia news, Ukrainian President Viktor Yushchenko implicated the Russian government in the election-year poisoning he suffered in 2004. So it appears the Pubilc Security Ministry of China is doing its work. Who are they? You ask? They're the 30,000 people hired by the Central Propaganda Department to monitor the internet for political threats like the folk song written recently by civics teacher, Li Hua. Mr. Li sung that local Communist party officials had "sold us like pigs, sold our flesh and sold our doo-doo" after his school was swallowed up by a larger private institution in which the officials had a financial stake. Mr. Li posted the critique on the internet, getting himself seven days of jail-time (no trial), two interrogations, and the pleasure of writing a note criticizing his own inappropriate behavior. Mr. Li, it's clear, did not have the benefit of knowing beforehand just how closely Chinese censors patroled the internet. 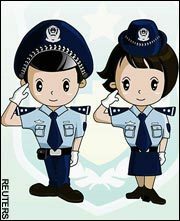 The Public Security Ministry has recently introduced two little cartoon characters in police uniforms that will pop up (every half an hour) on internet users webscreens to remind them that they're being monitored. Chinese officials hope that these will discourage such rabid dissidents as Mr. Li from "disrupting social stability" ahead of the Communist Party Congress in October. *** Labor Day made it a short week in the US, where economic data continued to suggest the economy was moving toward recession. *** Sources out of Washington told the Financial Times that the Chinese PLA were very likely to have hacked Pentagon computers, but cyber-spying on the information infrastructure of the US Department of Defense doesn't elicit much of a response from the White House these days. Perhaps it was busy planning its upcoming war with Iran? *** Across the Atlantic, Russian officials threw a public hissy fit when the EU mentioned the prospect of legislation that would prevent Russian state-controlled corporations from taking over European energy companies. Later in the week, Russia sent eight bombers up above the Barents sea, apparently just to see if the UK and Norway would pay attention to them. They did, but EU leaders seem a little hush-hush about the group rendez-vous up in the skies. *** And where would our week have been if we hadn't caught Vladimir Putin shirtless, strolling by an evergreen shielded stream in his crucifix and military fatigues? The Financial Times has reported that the Chinese military successfully attacked the computers of the US Department of Defense. Reports say that the US was forced to shut down a part of the Pentagon computer system. 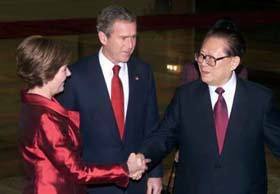 "Another person familiar with the event said there was a 'very high level of confidence...tending toward total certainty' that the People's Liberation Army was responsible." Hacking into the computer systems of Western governments is becoming a regular past time for the Chinese military. Last week, you may or may not remember, Spiegel reported that the China had hacked into the computer systems of various German government ministries. The US and Germany have this history of cooperation thing. Both democracies. Cold War allies. Then there's that whole free market and efficiency thing we have in common. Maybe somebody wants to say the word 'NATO'. Or 'free world'. Loudly. Oh, don't worry Beijing. Google or Yahoo! can block that search, too. Nobody outside of the communist party will have to know. Ian Bremmer from Slate has written a good article on why it's unlikely that the world will see a Sino-Russian military alliance despite the fact the two countries staged joint war games at the SCO a few weeks ago. Two points, though, before you dive in. 1) Mr. Bremmer grossly misunderstands the character of Russian power and the Russian government's desire to re-assert itself as a world power. He presents Russian references to international and domestic rule of law as if they were a sincere attempt to abide by some geopolitical ethical code. This perspective is naive. The Putin administration has no regard for the deeper importance of rule of law. Russian foreign policy is power increasing power for the sake of more power; law is merely one of the instruments it will use to secure an advantage. "Foreigners: Opinions about events beyond our borders"
doesn't really encourage the proper approach to international events here in the States, now does it? "Those people who look and talk funny: Opinions about the people who hold all our debt "
Now that's a column header. German Der Spiegel reports that Chinese spyware was detected in mulitple German government computer networks. These included the chancellery, the foreign ministry, and the ministries of economy and research. German intelligence services discovered the operation in May. Information networks were infected with "Trojan" spyware when Microsoft Word and PowerPoint files containing the virus were opened. Hackers based in the northwest Chinese province, Lanzhou, used this software to steal German governmental information on a daily basis until German intelligence services took countermeasures. German officials told Spiegel they believed the People's Liberation Army of China was directing the operations. China's rapid economic development over the last decade has also seen it rise as a more potent player in the international game of power. In mid-August, the Chinese and Russian militaries staged war games in Russia to mark the end of the SCO (Shanghai Cooperation Organization) summit. The war games brought together 6,000 military personnel from Russia, China, and four other Central Asian nations. German Chancellor Angela Merkel has pressed China to address climate change in her first day of a three day visit to the country. Chinese industry has been fueling its rapid economic growth largely with dirty coal and oil. Chinese air quality has suffered as a result. Only 1% of Chinese citizens breathe air considered safe by EU standards. Chinese pollution also clouds the air of Tokyo, Seoul, and Los Angeles. The International Energy Commission has reported that China will overtake the US as world leader in greenhouse gas emissions by the end of this year. According to the Netherlands Environment Assessment Agency, China has already passed that level. Much like the United States government, the Chinese government has refused to take responsibility for its enormous hand in worldwide environmental damage. It has provided excuses and appears to value short-term economic expansion at the expense of long-term economic stablity. As in the US, the thrill and comfort of profit in the short-term is preferred to preserving a prosperous and habitable world for future generations of humankind. Add political inefficiency to the rap sheet, too. Both the German and French economies showed slow-downs in the second quarter, growing at .3%. In the UK, inflation came in below analysts' forecasts at 1.9% for July. In the US, the Nasdaq is set to open a private, unregulated stock market for traders with more than $100 million in assets. In the US again, Mattel recalled toys that were made in China, and could possibly contain lead paint. And, a subsidiary of the Russian steel giant Severstal, has acquired a 22% percent stake in the Irish company, Celtic Resources Holding, plc.